Toberua Island Resort is located off the east coast of Fiji, and with seamless bus and launch transfers available from Nausori Airport or Suva City, access to your own slice of Fijian paradise couldn't be easier! This Fijian Island Resort boasts 16 traditional oceanfront bures with high ceilings and thatched roofs, private ensuite bathrooms with adjoining courtyards and round the clock hot water. 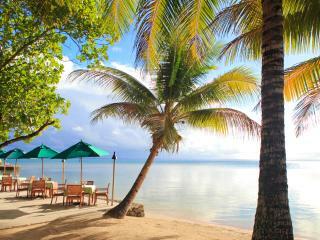 Toberua Island is surrounded by white sandy beaches, crystal clear water and variety of coral and sea life to explore.